NT: Right off the bat, I have to know if the name The Hawk In Paris is in any way a reference to the 1956 album by tenor sax jazz legend Coleman Hawkins? Dan: It is, it is. It’s funny because Matt Bronleewe came up with the title and we had all heard the experimental live jazz record and thought “ok, that sounds cool.” But some of it was, we were just enamored with the cover art. There’s this lady and she’s got this hawk and we thought, “That’s kind of fascinating.” (laughs) I think a lot of what The Hawk In Paris “is” is a departure from where most of our time is spent creating, which is within genres that have some pretty substantial confines. Even the name being this whimsical thing, a lot people have asked “what is the spiritual significance” and there really isn’t any. We just love it and we thought it was cool and playful and intriguing. (laughs) But it really is almost an intentional push away from that spiritual thing. There really isn’t any of that on this project and there won’t be if we have our way. NT: The “official story” is that The Hawk In Paris was birthed back in 2009 when three old friends got together to do some unrestricted musical experimentation. What all led up to the formation of the band and the eventual release of your first EP, His + Hers? Dan: Matt and I came together after about 10 years of not writing or doing anything to just kind of see what would happen. We both had a break in our schedules and we were both kind of feeling that itch to do something different. I’ve been in Jars of Clay for 18 years and I have to write kind of a certain way for Jars. Jars has a space that we pushed for and elbowed our way to create a bandwidth where we can write about a lot of things, but it’s perceived differently. We wanted to work on a project where it was, “This is honest and where we are.” We’re just excited to create outside of what we normally do. So we got together and started writing. We brought Jeremy in to see what he would do creatively with songs, knowing that his huge strengths are in synths. We wanted to draw more from our influences with music that we’d grown up with. That bizarre space of what we thought that music sounded like versus what it actually sounded like. Which is cool. The formation was really just we write well together, we’ve done projects in the past that have been really fun and creative. Let’s just see what happens. NT: Do the three of you have somewhat defined roles or leanings towards certain aspects of the music or was it just a completely collective effort? Dan: We definitely have roles but they are pretty fluid. I mean, I didn’t really do much of the instrumentation at all. It felt like my role was relegated to lyric and melody a lot of the time. I obviously had a voice in it, like let’s try this or put this here. What you hear on the EP and even the reason they are two versions of “The New Hello,” is because we literally would write a song and then figure out what the presentation of that song is supposed to be. So we would try one thing and be like, that doesn’t work and this works great but so does that. Some of that is our indecisiveness as we were creating. It was really collaborative though and Matt and Jeremy would always be bouncing ideas off each other, right up until we were getting ready to master. The “hers” version of the song was literally finished the day before we mastered the project. We went back and were like we need something else and we redid it even then, which I love. I love that we weren’t so married to things that anything was concrete before it was on the project. Even now, it’s an EP. So by the time a record comes out, it will evolve even more. NT: The musical direction of The Hawk In Paris blends the 80’s synthpop of bands like Depeche Mode, Pet Shop Boys, Alphaville and New Order with the modern electronic elements of bands like Washed Out, Friendly Fires and Owl City. Did this type of music have an affect on you growing up and what draws you to it now? Dan: Yeah, my first band was four keyboard players and we would do Depeche Mode and New Order covers. That was it. Before that, I was into hair metal bands, things like that. I grew up in Massachusetts and New England is a hub for classic rock. A friend of mine, a girl that I really, really liked introduced me to Depeche Mode. She handed me the Black Celebration record and it kind of changed everything for me. At that point I was like, “Oh my gosh, what I have I been missing.” So I would go back to the Kraftwerk stuff and I found Nitzer Ebb, bands like that. That was more on the industrial side of it. So I was a huge fan of a lot of the electronic and industrial music that was coming out of the 80’s and 90’s. It was a huge part of my upbringing and played a huge influence. NT: Do you listen to a lot of the bands that are doing it now? Do you find the same things or do the older ones hold a stronger sway in you? Dan: The newer ones I love too. I think there’s something about the genre of electronic music that people really take a lot of risks. It really is the space, not that it’s completely relegated to that, but it’s really where new sounds come from. Obviously in pop music, one of the things you care about is the rhythm aspect. The drum and bass aspect of what you’re doing. I’ve always found that what makes a record stand out is what they’ve done with the drum and bass. Obviously there are songs involved in that. But there’s this element of “I’ve never heard a kick drum sound like that” or “I’ve never heard that rhythm over there.” Like, Friendly Fires, I love because even on their newest project, I feel like they takes these risks. Rhythmically, I think Owl City is fantastic just because of how clean everything is. I think there’s enough nostalgia in those projects to remind me of what I love about Depeche Mode, New Order, or Pet Shop Boys but then they’ve taken it and said now we’re going to add our own thumbprint to this. I love a lot of the new stuff. Trentemoller is a DJ and I found one of his records. It was what reintroduced me back into electronic music for a little while. Then, discovering the M83 record Saturdays = Youth and going “okay, this records matters to me.” It sounds like everything I listened to growing up but then it sounds completely new at the same time. I love to find a lot of those bands that are doing it well. NT: In the discussion of organic vs. inorganic instrumentation, words like “cold” or “metallic” are usually used to describe electronic music. How were you guys able to bypass those missteps and what do you think is the secret to the blood and heartbeat that’s found throughout His + Hers? Dan: That’s a really good question. Well, hopefully this won’t sound contradictory to what I just said. (laughs) But I think songs matter. We’re all songwriters in the band and that ability to weave passion into the songs is just the residual byproduct of being songwriters and not just DJs. I think we come at it from a perspective where it has to inspire us as well. It’s probably because some of the artist I listened to growing up, Peter Gabriel or U2, the lyric mattered. Even Depeche Mode, the lyric mattered. It was dark and it was bizarre sometimes, but they were still trying to communicate something versus just the DJ culture that was just trying to kind of create a party. When we were working on this project, it felt like it mattered to still care about the lyric and that element of passion. I think it would’ve been hard to remove that from the process. And luck, I guess that it’s there and it’s together and it works, because sometimes it can become too melodramatic and you can overdo it. NT: What are some of the differences in writing electronic-based pop music, as opposed to writing rock-based music for a full band? Dan: I think some of it is, with Jars or when I’m writing for other projects, it starts with an acoustic guitar or piano and you just sit down and bang it out. A lot of the writing for The Hawk In Paris originated with loops or these little modal bits within a track. Matt or Jeremy would already have this electronic thing and we would see if it would strike anything or we would weave through some of the library of that kind of stuff. So, the origin of where it began was a little different for sure. Outside of that though, it wasn’t that different because we were still reliant on the melody to drive it. Eventhough you can create instrumental hooks, we felt like we wanted to rely on a strong melody to begin with. That might be different from a lot of electronic artists because sometimes you rely heavily on just the musical hooks. Then the lyric and melody becomes secondary to those things because you’ve created a mood or something that was memorable or repeatable. But we still felt like wanted to care about the actual melody. So that’s a little different maybe. NT: As a big lyric guy, I’m really impressed with the writing on His + Hers. Did the shift in musical moods and sonic textures open up new lyrical themes and ideas as well? Dan: Yeah definitely. Some of it was just the permission to write a little bit more melancholy. That was what we all loved about the music we listened to growing up. It was a bit of the goth perspective but it was cool to us. So we wanted that. You don’t really get an opportunity to write that way, like I wouldn’t write that way in Jars. I do a little bit but then people go, “that’s a little depressing, you need to lighten that up.” (laughs) So I feel like this was good because we didn’t have to care at all about that. If we’re going to do it, we’re going to dive head first into this melancholy side of love and relationships and just be off with it. NT: The word “love” or “lover” can be found in every song on His + Hers. Was that a conscious thematic element or just a grand topic that naturally creeps into everything? Dan: I think it’s both. With trying to write even more universally within the scope of this project, I think love is a big idea. We did intentionally want to write about that melancholy love, so it kind of crept in there a lot. NT: I wanted to ask you a couple of questions about the incredibly beautiful lyrics to “Put Your Arms Around Me.” First, is the mention of “the great divorce” a specific reference to C.S. Lewis’ book? Dan: It’s not, no. That was more of the disconnect in the way we feel responsible for the things that happen around us. It’s probably the one song on the project that actually pushes into some of the social commentary, where much of the songs are more about love and relationships. That one’s a little bit more, “let’s take a look at our world and what we decide we don’t want to be a part of.” The things that aren’t going to change and the disconnect of suburbia from what’s really happening in the world. The whole idea that we even think ironically about suburbia. We dress like we’re an urban community and act like we’re an urban community but we live in houses with big lawns. It’s a safe space to pretend that we’re something we’re not. We poke fun at the people that live in neighborhoods and we think that it’s not viable and we don’t recognize that that’s us. We somehow believe our own trickery. At least the part where it talks about “rolling windows up in neighborhoods we drive though in our cars, most days we can avoid them so things will stay the way they are,” is literally just to say here’s our world and what are we going to do with it? NT: Second, the lines “We’re afraid of our conclusions. What we love will kill us first. And the way to tell the difference from what we hate only makes things worse” seem to carry a lot of weight. Can you break those down a little and tell us what was behind them? NT: His + Hers is bookended with two different versions of the song “The New Hello.” Was it an intentional decision to write a “his” and “hers” version or did the song just naturally sound good within two different attitudes? Dan: It was. The original version of the song was a little bit more like the “hers” version. It was a little more anthemic. It had a little more of the… we call it the “John Hughes flavor.” (laughs) Cause it’s more of that 80’s anthem type thing. 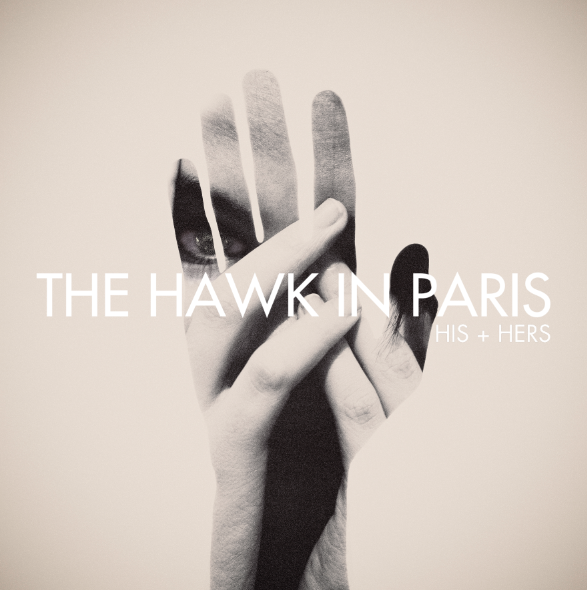 It had a little bit of that but for some reason when we were getting into the process of writing other songs, there’s a whole other side to The Hawk In Paris that people haven’t heard and what’s crazy is that it makes that “hers” version, which is the version that people seem to really love, almost feel like it shouldn’t be there at all. There’s stuff that’s a lot more aggressive. There’s stuff that’s more like what you’d find in the dancehalls. We kind of draw more from the Nitzer Ebb side of things, the more aggressive side of that sound. Since that version didn’t quite fit, we put it away for a long time. But because we loved the lyric and the idea of the song, we wanted to find a skin that might work. So, Matt and Jeremy went back and forth and eventually landed on the “his” version. Which they started developing and it grew into this thing. Then when we were listening back through it was like, “That’s really cool but there is something about that version that is really different and missing from the original version.” So we went back to it and thought, "You know what, this is actually pretty good. Let’s just use them both because it’s almost like they’re different songs." I was excited that we circled back around and found a way to get the “hers” version to really make sense. That’s one of my favorite moments on the EP. NT: As people start listening to and getting lost in His + Hers, what types of activities and conversations do you hope to be soundtracking? Dan: Wow, that’s hard to say. There’s not really an agenda for it. There’s not even really a face to it yet. Just yesterday I had a friend that said, “I just finished listening to the EP and there are sounds on there that reminded me of experiences I forgot I even had.” They said it was almost like opening a book with chapters of your life that you didn’t remember but that still inform the way you do things now. In a sense, you kind of go, well that’s what music does. If I listen to Bryan Adams’ “Heaven,” that is the song that transports me to the dance and I’m against the wall and I’m like “I’ve got to ask some girl to dance with me.” (laughs) But there’s this sense of nostalgia that becomes important to people again. So I love that part of it. I like that, for people that are my age and my peers, it will do that. I also want to be a part of the conversation of innovation in music. That’s something that matters a lot. When we talk about The Hawk In Paris among the three of us, we are wanting to forge new ground. We’re just kind of getting started and this is our first stab at it, but we have the sense that it’ll get crazier. Some of it will get less accessible. But the whole point is we want to stay out in front musically. So maybe we want part of the conversation to be that these guys are innovative and doing that.